i don’t even like shortbread but i sure like these. mix flours, nuts, petals and sesame seeds. in an electric mixer whip the earth balance and coconut oil. the coconut oil won’t want to whip, so stop and scrape down your bowl intermittently. don’t worry if there are little pebbles of coconut oil intact, it makes a nice texture. add the sugar rosewater and salt (if using) and mix until smooth. add the dry ingredients and mix until it comes together. it will be pretty sandy, so mix for a bit and then get your hands in there and fold it over and a few times until it comes together. wrap in plastic (this will help squeeze it together too) and then refrigerate for an hour or more. when you’re ready to roll out, let your dough warm up a bit so it’s easier to to roll. roll out on a lightly floured counter to about 1/4 inch and stamp out your cookies, i use a small juice glass about 2 1/2 inches in diameter. 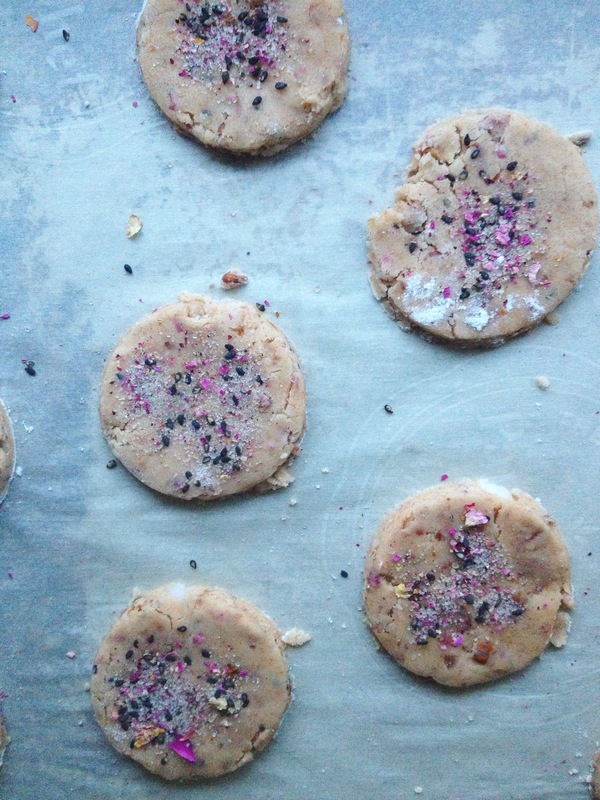 put on a parchment lined baking sheet, gather up the scraps, roll it back out and cut remaining cookies. with a mortar and pestle, smash up up some more rose petals, sesame seeds and sugar (about 3 tbsp total) and sprinkle on top of each cookie, pressing in very lightly. bake at 350 degrees for about 15 minutes or until golden around the edges. let cool on parchement and then eat em up.